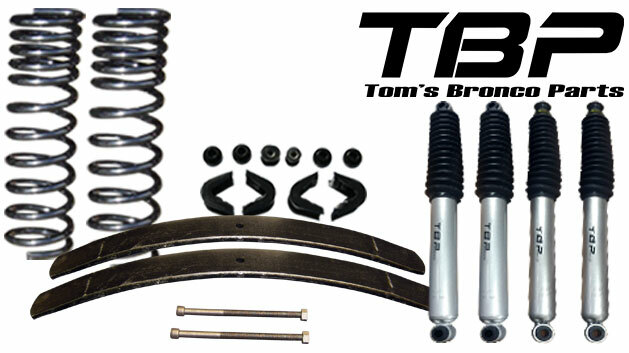 At Tom's Bronco Parts, all of our Suspension Lift Kits for the Classic Bronco include New Leaf Springs or Add-A-Leafs, New Coil Springs, New Polyurethene 14-pc C-Bushing Kits & New Shocks. 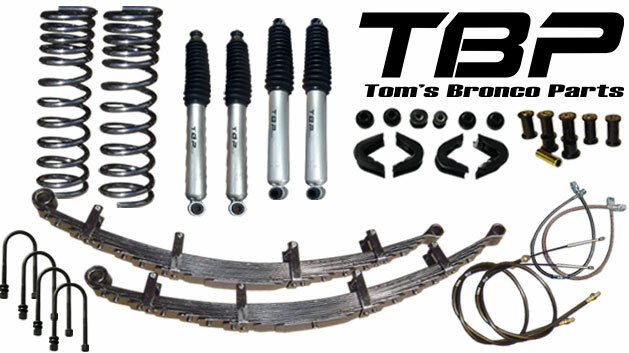 For a 2.5" Lift, there are some other parts that come highly recommended for varying reasons. Below are some parts we recommend along with the reasoning behind it. Adjustable Tracking Bar: When the Bronco is lifted, the frame and differential separate by the total amount of the lift. When this happens, the stock tracking bar will start to pull the front differential over toward the driver's side. This causes the frame to be off-center in relation to the front differential and is one of the biggest causes of steering issues found when lifting a Bronco. The adjustable tracking bar allows for optimal adjustment to center the front differential under the frame, helping to prevent bump steer and other handling issues. Adjustable Draglink: In the same way the tracking bar pulls the differential toward the left side of the frame when lifting your Early Bronco, the draglink will also be forced to pull the pitman arm toward the right side. This will effect the centering of your steering box and you will in effect have more turning radius to the left and less turning radius to the right. An adjustable draglink will allow you to dial in the centering of your steering box to regain full turning radius in both directions. Extended Front & Rear Center Brake Hoses: At 2.5", the brake hoses are stretched pretty tight. While they will generally work, this poses a potential threat of a broken brake hose if the suspension is extended too far. You don't want to lose your breaks when you are extending your suspension, so the added safety of replacing these two hoses is well worth the small expense. Extended Rear Emergency Brake Cables: In the same way the hoses are extended close to their limits, the rear e-brake cables are also highly extended. 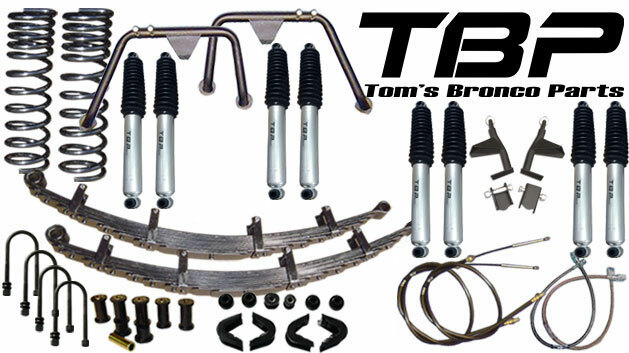 Again, extending the suspension in the rear could potentially be limited due to the length of the stock e-brake cables. Extended parking brake cables eliminates this concern.